What is a Surge Protector and what does it do? The surge protectors that we supply are installed in the main panel box, the heart of your home’s electrical system. They are designed to stop lightning or power surges at the panel, before they enter the rest of your home, unlike the point of use surge protectors that stop a surge after it is already in your house (and next to your walls, furniture, carpet drapes and other flammables)! The panel surge protector diverts all of the energy away from your home and out into your home’s grounding system. You will want to make sure you have a good grounding system (our electrician can inspect the grounding system while he is there installing the surge protector). Additionally, surge protectors “clean up” the minor fluctuations in energy that occur throughout the day. While these small spikes in power may go unnoticed by you, over time they can wear down and reduce the lifetime of more sensitive electronics. Will a surge protector help me save money on my power bill? No. A surge protector is simply a gatekeeper, not an energy saving device. The power coming to your surge protector will have already passed through your meter and be recorded to your account with your electrical service provider. The surge protector is designed only to block surges in energy. Will a surge protector in the panel box protect everything in my home? Yes, however, there are several ways lightning can enter your home. The most common way is to travel along the main electrical, cable or phone lines after a strike. Lightning commonly takes the path of least resistance to quickly exhaust all of its energy. While lightning is extremely powerful, it is also pretty lazy, and its preferential path is an unobstructed one. A whole house surge protector will protect your entire home once the voltage increase reaches the electrical panel, but will not be able to prevent lightning damage on circuits the lightning hit before reaching the panel. This is why secondary “point of use” surge strips and plugs are very important to a comprehensive protection plan. Should I keep my current plugin surge protectors? Yes, we recommend that you use any “point of use” surge protectors or “power strips” that you already have behind your TV, computer, or other sensitive equipment, as added protection! Lightning can still strike the gutter or roofline, for example, and then “jump” to a nearby cable and travel through your home that way, bypassing the surge protector altogether. In an instance like this, the point of use surge protector that your equipment is plugged into would block the surge. The main panel surge protector is about the size of two decks of cards. The cable and phone surge protectors are smaller. Whole house surge protectors are installed at the main electrical panel or meter in your home. What if I have more than one panel? If you have more than one panel you may or may not need two surge protectors. It depends on how your panels are fed from the meter. The electrician can look at it and let you know. Is there a warranty on the surge protector? Yes, there is a warranty offered by the manufacturer including a limited warranty for damage to connected equipment (appliances, furnaces, well pumps, etc.). These are generally up $25,000 – $75,000 per occurrence. Please check the warranty information on your unit for exact details. We encourage customers to look at the warranty when buying surge protection. However, the most important thing is that you have surge protection. The worst call we get is from a customer who didn’t get a surge protector installed, for whatever reason, and now has extensive damage and costs to worry about. Is my flat screen TV covered by the warranty? Televisions are protected by the whole house panel surge protector connected equipment warranty if a point of use surge protector is installed at the plug and have the all the television components (cable, power, etc.) running through the point of use surge protector at the time of the incident. This is a warranty requirement found in the fine print of most surge protector manufactures instructions. 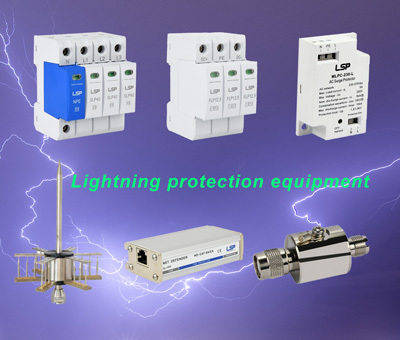 Install secondary surge protection on your sensitive electronics and equipment. What about Cable Surge Protection; how does that work? The cable surge protector is very similar in function to the panel surge protector. It is installed in your cable box, which is usually found mounted on a wall outside your home. It works the same way as the panel surge protector does by stopping excess energy right at the source, before it enters your home, and diverting it out into your grounding system. If you have cable television or Internet service, you want to have a cable surge protector because a lightning surge can travel along your cable line and into your computers, televisions, DVR, DVD players, and any other connected equipment. You also want to be sure that you have an adequate and properly installed grounding system and that your cable system is connected to it. What about Phone Surge Protection; how does that work? The phone surge protector is also very similar in function to the panel surge protector. It is installed in your phone box, which is usually found mounted on a wall outside your home. It works the same way as the panel surge protector by stopping the energy right at the source, before it enters your house. If you have a home phone line and/or are using a phone line for your Internet, you want to have a phone surge protector installed because a lightning surge can travel along your phone line and into your computers, corded phones, and cordless phone bases, answering machines and any other connected equipment. You also want to be sure that you have an adequate and properly installed grounding system and that your phone system is connected to it. We have a good grounding, do we still need surge protection? A good ground is important for surge protection devices (SPD) to work properly. AC power SPD’s are designed to divert surge current to ground by providing the least resistive path. Without surge protection on the AC power, the surge current will look for other paths to a good ground. In many cases, this path is found through electric/electronic equipment. Once the dielectric strength of the components in electronic equipment has been surpassed large currents begin to flow through the sensitive electronics thus causing failure. Many areas of the world do not experience as many lightning-related problems as others. As much as companies today depend on their control and network systems, the system availability has become paramount. For most companies, a single surge related incident in a ten-year period, which causes the loss of system availability, would more than pay for proper protection. Why do I need to protect data/control lines? Data and control interfaces suffer many times more damage from surges than do power supplies. Power supplies normally have some type of filtering and operate at higher voltages than do control or communication interfaces. Low voltage control and communication interfaces normally interface directly into the equipment through a driver or receiver chip. This chip normally has both a logic ground reference as well as the communication reference. Any substantial difference between these two references will damage the chip. Full protection is one of the most inexpensive insurance policies you can buy. The cost of system unavailability is far more expensive than proper protection. One major surge event in a ten-year period far outweighs the cost of protection. Why is your protection more expensive than others I have found? The MTL surge protection devices are actually medium priced. There are many more expensive devices on the market as well as the low-cost commodity devices. If you look at the four main factors: Price, Packaging, Performance, and Safety, the MTL product offering is the best in the industry. MTL offers complete solution plans, from the AC power service entrance down to the individual equipment and all the control/communication lines in between. The Phone Company has already protected the incoming phone lines, why do I need additional protection? Why is it in a plastic enclosure? Metal housings are frequently used for TVSS because of the risk of failure causing fires or even explosions. UL1449 2nd Edition dictates that TVSS units MUST have safety features that prevent fires or explosion in the event of failure. All ASC products are independently tested by UL to ensure that they fail safely. In addition, the Thermoplastic box is NEMA 4X rated with gasket doors. This means that it is an Indoor/Outdoor unit. The housing is corrosion proof and UV stabilized. The clear door allows the status of the modules to be read clearly through the door, removing the necessity of lights in the door and the associated circuitry.